Good morning, friends! 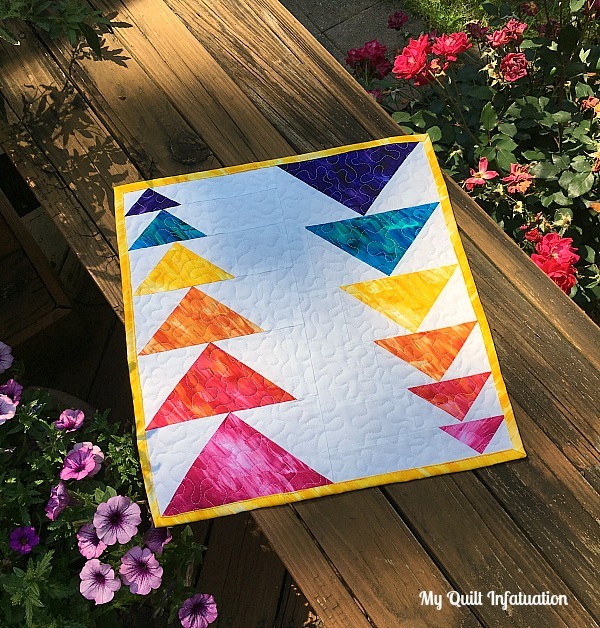 Today, it's my turn on the Sew In Love With Fabric Summer Mini blog hop, and I'm so excited to share this little mini quilt with you, featuring the Patio Splash fabric collection. These particular prints from the collection are called Color Strokes, and they are absolutely gorgeous. They have the perfect amount of texture for when you are looking for fabrics that are almost solid, but not quite, which makes them extremely versatile. They are so saturated and fun, and are perfectly summery! I decided to design a mini quilt using flying geese, a classic quilting building block, but give it some interest by varying the sizes to create the sliding effect. I have written a full tutorial for this mini, making it super easy! Be sure to head over to Sew In Love With Fabric to check it out the full tutorial. But before you go, I'm thrilled to let you know that Benartex is offering a fat quarter bundle of these luscious fabrics as a giveaway, so take a second to enter. Just leave a single comment on this post to enter the giveaway. I'll announce the winner at next week's Needle and Thread Thursday post (5/24). By the way, and I also have FOUR other amazing giveaways going on right now which also run through next Wednesday evening. To enter those as well, just head over HERE to check them out. All of these giveaways have ended, and I'll announce the winners this afternoon in my NTT post! Good luck to all, and happy (almost) summer! You can never ever go wrong with Flying Geese! Or bright happy colors! I like your quilt and the fabrics are great! Thanks for the opportunity to win them. Your Flying Geese quilt showcases these beautiful fabrics well! The colors are beautiful and the texture look to the fabrics add dimension. Lovely! What fun and bright fabrics! Wow--what gorgeous fabrics! Love the color and subtle texture. I love the flying geese tutorial! Thanks for hosting the giveaway. Great mini--I love those bright colors! Love those fabrics! They are so different than anything I have seen before. And your mini is too cute! Thanks for sharing. Those colors are so rich! Beautiful mini! Oh my gosh! Those fabrics are absolutely gorgeous! I am always on the lookout for those "not-quite-solid" fabrics. Love them!! And I love your mini! Super cute. Yummy rainbow of color! Really pops with the white background! Cute mini and lovely fabrics! Flying geese are one of my favorite quilt blocks. 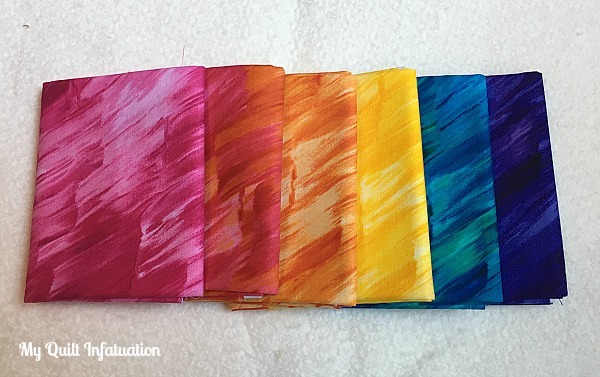 OOooh, the Color Strokes fabrics are perfect for your mini! Flying Geese blocks are one of my favorites, so I will head over to look for your tutorial! Thanks Kelly! those fabrics are stunning - love love love the bright colors! Really cute. Can't go wrong with flying geese in anything. Loving this fabric - and of course your mini! Love these happy colors. I've been making flying geese lately and I love how the different sizes dance on your quilt. These colors are really great. I love how they look in your mini. Would love to win them. Lovin' these juicy colors. Did they make a green as well? Really beautiful mini, and the fabrics are gorgeous! The fabrics remind me of sherbet ice cream and summertime. Love the variation of color. Such rich colors. Thanks for a chance to win. Wonderful colors - yummy! Thank you for a chance to win. The fabrics are really pretty, and I love your idea! Thanks for sharing. I love rainbows and love rainbow quilts even more. ;) Thanks for the chance! I am so glad that I did not miss your great tutorial and fantastic project today! I love it! With your tutorial, I am going to make a Project Linus Quilt. It would be fabulous to actually be using these gorgeous fabrics you are using! So, thank you for the opportunity to win this Fat Quarter Bundle and the great tutorial! Have a great day! Beautiful mini quilt in wonderful fabrics! I love how you've oriented the flying geese! Love the mini, too cool!!!! Love the fabric and how you highlighted it in the mini quilt. Thanks for the giveaway! Wow, that is such a fun quilt. You did a great job! What an awesome Mini! Love it! I'm going to have to look out for these prints. So bright & festive! So cute! Love the colors of those fabrics. They would work in so many projects. Great concept for a mini flying geese quilt! Thanks for the chance to win - I love the bright colors! Oh yay! Bright and beautiful!! Love the bright and outstanding colors! Great mini-quilt! This is just outstanding - beautiful colors and what a great pattern! Thanks. Love the mini. I plan on putting up a small art gallery in my hall for my grandchildren to admire. This will be perfect in such bright luscious colours. Bright and happy colours. Great mini and tutorial. Lovely mini quilt...thanks for such a clear tutorial and tips for the process! VERY beautiful colors on those fabrics! Flying geese in any form are so fun to make! Flying Geese! Always a favorite! Love the colors! great fabric colors and they go so well with the flying geese. Great quilt with such bright and happy colors. Thank you for your great tutorial! This is so cute!! I love the colours. Thanks for sharing the tutorial. I've always like flying geese and this is so nice. I love the colors of the fabric and the size is really doable on a moment's notice. Your mini is fabulous! I'd love to take this idea and see what I can do with it on a full sized quilt. Beautiful colors and a sweet mini. Thanks. I like that fabric and your flying geese shows it off wonderfully! I really love your mini. The fabrics are just gorgeous for it. Thanks for the giveaway. Your mini is awesome. Thanks for the tutorial, I will be making one for my mini wall. Cute mini! I love the contrast between the colors and the white background. Thanks for the tutorial and giveaway. Love the colors and what a cute mini to brighten up any space! Lovely batiks and geese!! I love it! Thank you! I love this mini! Thanks for the opportunity to win. Now I'm heading back to Benartex to save your tutorial. Loved your mini. Thank you for the tutorial. What cheery geese! Such a fun mini! Is it Summer already? Benartex has some really lovable fabrics. these fabrics speak to Summer so well. Love your mini, and the gorgeous fabric! I'm saving your tutorial to try sometime soon! Thanks for the giveaway! What a nice twist on a traditional pattern! And the fabric is perfect for this energetic arrangement. The colors are amazing. I want them all. What a sweet little quilt and I love the colors and pattern of the fabric. Thanks! These fabrics look like summer fun and have so many possibilities! Thanks! It's hard for me to resist any rainbow project. Love your flying geese mini. Very bright and fun! Beautiful colours and love the flying geese! Kelly, just gorgeous and indeed a splash of summer! Might have to hang this one on my Patio:) thank you so much for your tips on the layout....this will make it easier and definitely a fun stitch. Beautiful. I love the rainbow effect with these colors and your design. Lovely collection! Pretty little quilt! Pretty little mini quilt, love the bright colors. What a gorgeous rainbow of colour! I love the colors and visual texture of this fabric. Your mini quilt pattern is a perfect showcase for them. Such a nice quilt - like how you graduated the sizes of the flying geese. Another fun idea to store for in the future..
Love the sliding geese with these yummy fabrics. I love fabrics like these. Rainbow colors are also a favorite. Beautiful colors. I love the flying geese and am always looking for an easier way to make them. I love the colors and texture appearance on this fabric ... Really pretty. Thanks for the tutorial as well. Love the design. Great colors! Love how you make your triangles. This fabric has reached out and grabbed me. I love it. That fabric is AMAZING!!!! I love solids that aren't quite solid. It is going on my list to buy. Thanks for sharing. Really beautiful fabric. Thanks for the give aways! Perfectly summery! I can easily see using these in many projects. Love your mini quilt---thanks for sharing it with us. And, those fat quarters are gorgeous! Love these fabrics. I particularly like the marbling effect they have. Beautiful texture for solids to add a little dimension. So fun! WOW!!! I alreaady have a pattern in mind just calling out for these. That is an adorable mini! I love the colors! Looks like everyone loves a giveaway! Pretty fabrics. These are gorgeous fabrics, so bright and cheerful. I love the brushmark look on this fabric! Those look yummy! Btw...love your quilt. Flying geese is one of my favorite blocks. Your little mini is just sew cute! I love your little mini quilt and the fabrics. I love your fresh and striking mini! Great use of color and shape. Thanks for the eye candy, the tutorial, your great blog, and for the chance to win! Beautiful colours, especially the blue/green. I love the movement in these fabrics and how well it goes with the pattern! I love your take on the flying geese and absolutely love the fabrics. I love anything "almost" solid! Beautiful fabrics and what a cute mini quilt! Those fabrics are gorgeous! So vivid! They look amazing in the mini! These are amazing colors! What a fun quilt this would be! I can see baby quilts with matching mobiles made in these bright eye candy colors! Lovely! Great fabric, fun design! Always love some flying geese! These fabrics are so pretty! I just found your blog through Hyacinth Quilt Designs and really love your patterns. I'll be back. And thanks for the flying geese tutorial and giveaway! I would love to make summer place mats with this 'quilt'! !